A pork chop refers to any of the cuts of the pig perpendicular to the spine. 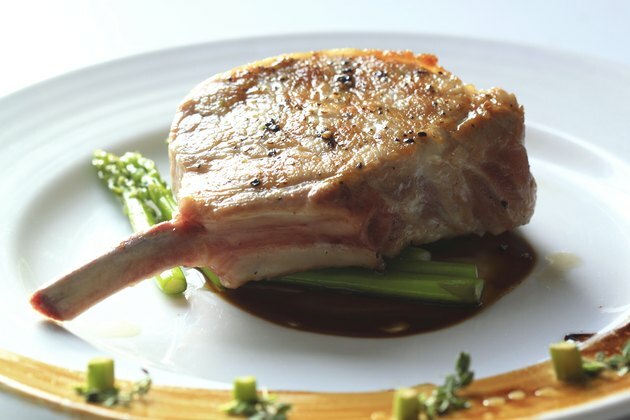 Some cuts of pork chops can be high in cholesterol-raising saturated fat and calories, but a lean pork chop, such as a sirloin or top loin chop, is the basis for a healthy meal. Braise, roast or grill your chops instead of frying them to avoid adding excessive fat during cooking. Pork chops have 24 grams of protein in a 3-ounce portion. Protein provides four calories per gram, and it is an essential nutrient for repairing muscles after exercise and for maintaining a strong immune system. Healthy adults should get 0.8 grams of protein per kilogram of body weight per day, according to the University of Illinois at Urbana-Champaign. That amount is equivalent to about 55 grams per day for an individual who weighs 150 pounds. The protein in pork chops is high quality because it provides each of the amino acids that you need to get from your diet. A 3-ounce portion of a broiled pork chop has 137 calories. Consuming more calories than you expend leads to weight gain, and choosing lower-calorie options can help you lose weight or prevent weight gain. Lean pork chops are lower in calories than alternatives such as beef or pork ribs or beef T-bone steaks. High-fat foods can be high in calories and lead to weight gain, but a broiled pork chop has only 4 grams of fat compared with 13.5 grams in a T-bone steak. Each 3-ounce portion of broiled pork chop has 1.9 milligrams of zinc. Healthy men need 11 milligrams of zinc per day, and women need 8 milligrams. Zinc is an essential mineral for many reactions in your body, according to the Linus Pauling Institute. Zinc deficiency can lead to a weakened immune system and night blindness. Top loin and sirloin pork chops are leaner than blade cut pork chops, which have 8 grams of fat and 2 grams of saturated fat in each 3-ounce portion. To further limit your consumption of fat and saturated fat, trim away visible fat from your pork chop before cooking it. Increase the nutrient content of your meal with pork chops by serving them with a salad or cooked vegetables, such as asparagus, or braising them in a mushroom sauce and serving them with brown rice.